Oh, how I love this time of year. And now since it’s officially October, I can fiddle around with some new Halloween decorations! First on my list? A Halloween door wreath! Pretty cute, huh? Wanna see how easy it was to make? 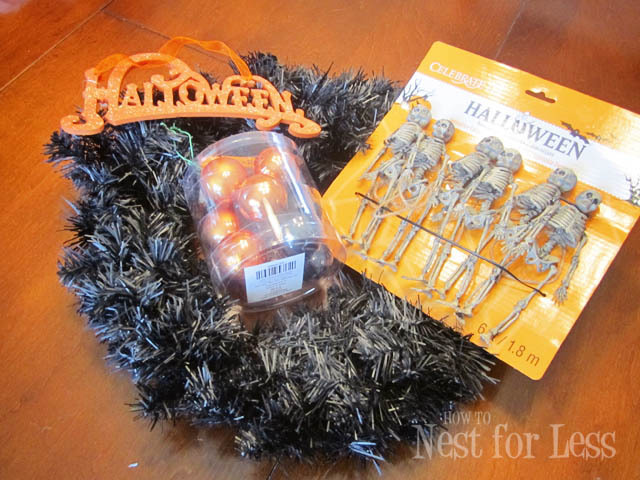 As for my supplies, I got a black garland wreath for $4 from Michaels, plus an awesome skeleton garland for $5 (I did have a 40% off coupon with me too!). Next stop was Hobby Lobby for black and orange Halloween ornaments, wired ribbon and a glittery Halloween decal. 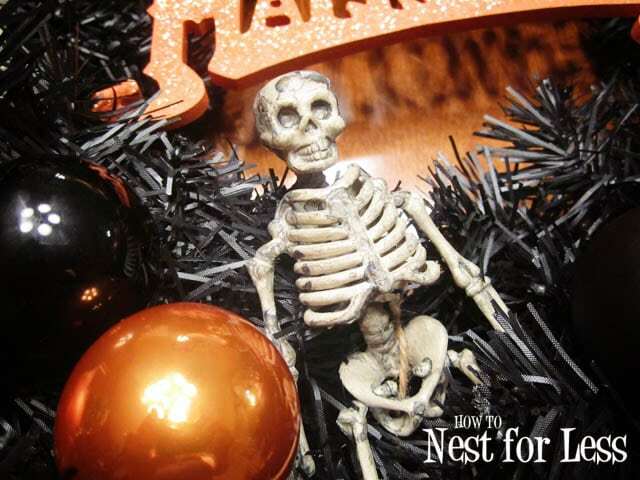 I started by taking apart the skeleton garland and tying each one to the wreath with twine. 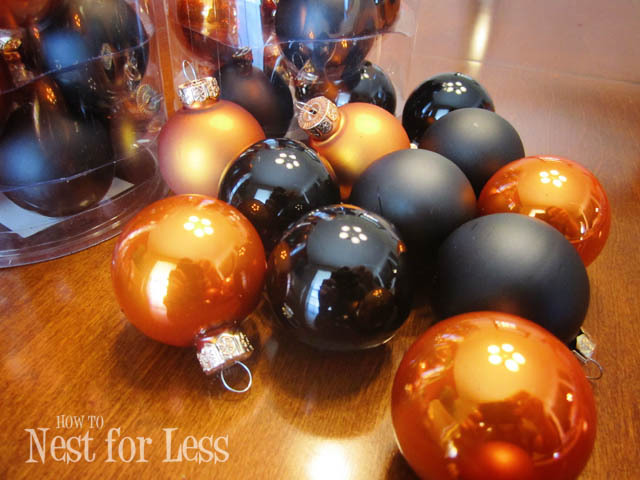 Next I got out the small orange and black ornaments I got from Hobby Lobby. I removed the top hooks from each ornament. I then used hot glue to secure each ornament (12 total) around the wreath. 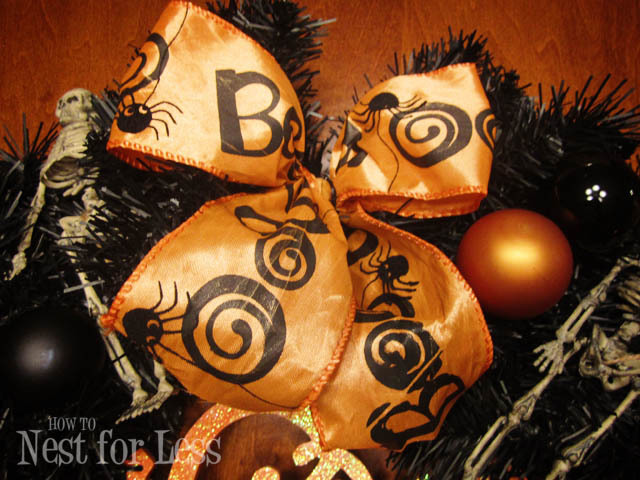 Next I tied the glittery Halloween tag sign to the metal frame of the wreath. 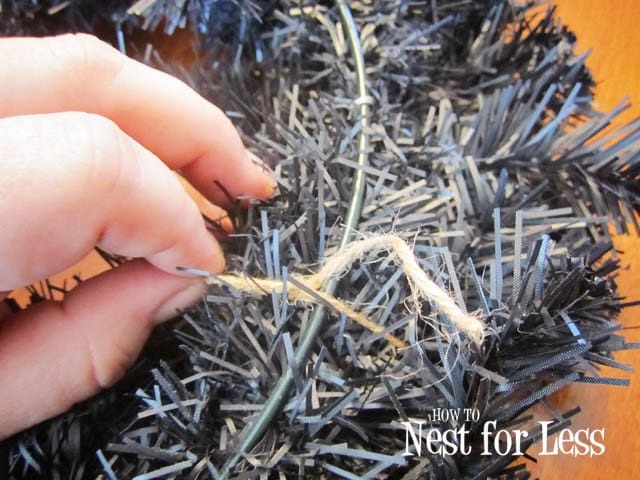 I just used black trash bag twisty ties so it would blend in with the black garland wreath. 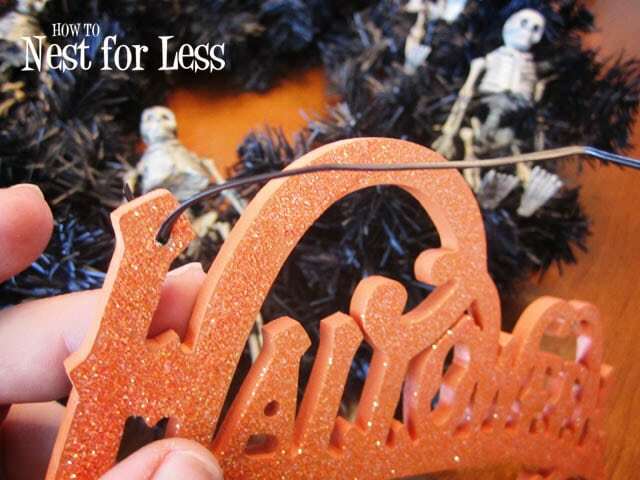 Note: the glittery Halloween tag sign came with pre-drilled holes from Hobby Lobby… score! I added a wire ribbon bow to the top of the wreath in orange and black to finish it off. So, what do you think? Spooky yet spunky? I love the skeletons…very spooky cool. 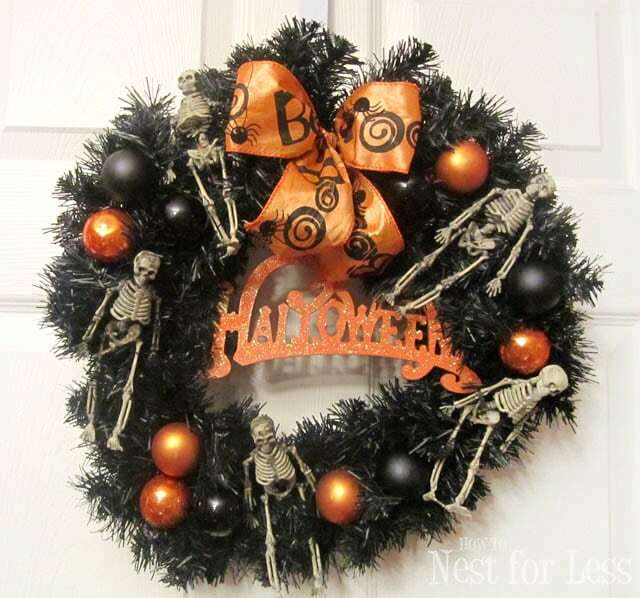 This is such a great idea for a Halloween wreath! I have been looking at some of your other post too, and see that you have lots of good ideas. I host Wednesday’s Bunny Hop Party and you are invited 🙂 Linky opens at 4:00 PT on Tuesdays. Turned out great! 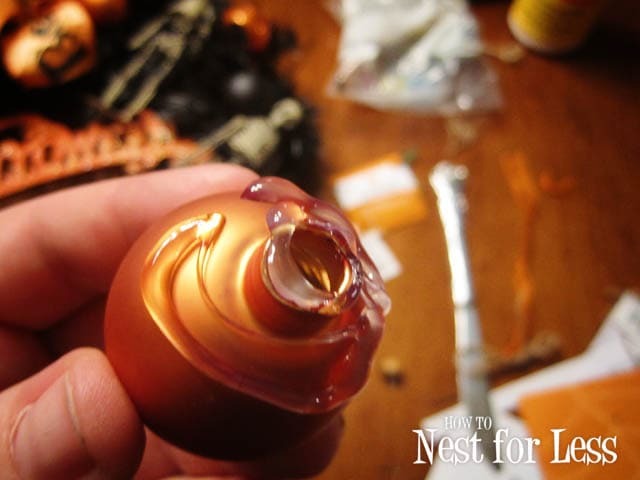 I would love for you to link this up to My Favorite Things Halloween Party going on all month! I hope to see you there! Well done! I’m working on wreaths this week, looking for those glass balls. I will probably have to make my own. Love how your wreath came out! SO CUTE! Thanks for sharing how you got it to all come together. I bought some of those little skeletons too just ’cause I liked them but now I know what to actually DO with them. I saw your post over at “Carolyn’s Homework” link party. Hi There! Just saw your post on Uncommon Slice of Suburbia! What a great blog you have!! LOVE these Halloween decorations! I am your newest follower. I hope you will follow back! Many blessings to you!! Hi Erin. I just saw your cute wreath on Wow us Wed. I love everything about it. It’s so cute.